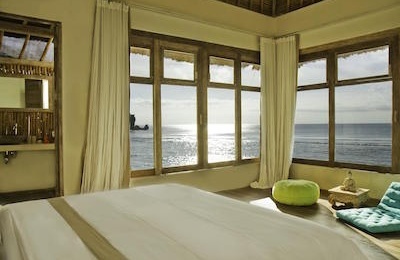 Impossibles Surf Hotel - Padang Padang, Bali Guests overall rating: ★★★★★ 5 based on 3 reviews. Relish lazy days at the cliff edge infinity pool, revitalising yoga and the pampering world of our Spa, where signature rituals are inspired by Indonesia’s Spice Islands. Play golf on world class fairways with breathtaking views, some of the best among Bali resorts. Discover the thrill of river rafting and elephant safaris, and delve into colourful local traditions as you watch the famous Kecak dance in Uluwatu’s seaside temple. Take the easy route to the beach, with an elevator opening directly onto our resort’s Surfari Sundeck on Impossible Beach below. A surfer’s paradise, Impossible Beach is renowned for its incredible waves, offering the challenge of a fast long ride along Impossible Break and the daring world famous Padang-Padang Tube, as well as easy take-offs at the nearby surfing beaches of Bingin and Dreamland. Tantalising your taste buds, the finest local, international and fusion cuisine is served in poolside bliss and on a rooftop with 360 degree views of the rolling ocean and Bali’s mesmerising sunsets. While Spice Spoons Culinary Journey invites you to step behind the island’s traditional culinary scene with richly interactive cooking classes that begin with a vibrant market tour.mExperience the perfect hideaway for romantic relaxation, or live the dream of a unique beach wedding with a ceremony in our glass fronted sea chapel at sunset, celebrations on the cliff edge lawn and the ultimate honeymoon in paradise. Located in the main hotel building, Ocean View Suites offer a spacious 84 square metres. Interiors combine touches of elegant design with colourful accents of indigenous Balinese art. Taking full advantage of the stunning ocean views, each suite features full length windows, as well as an outdoor Jacuzzi on the balcony for indulgent soaks with a dramatic Indian Ocean panorama. Conveniently located on the ground floor, each Garden View Pool Suite encompasses 84 square metres of luxurious amenities. Open your balcony’s sliding glass doors and step onto your poolside terrace, where your private plunge pool and an outdoor Jacuzzi overlook an inspirational scene of exotic gardens. Ocean View Pool Suites offer access to a private oceanfront infinity pool with a prime position directly facing the sea. A spacious 110 square metres, these suites feature an outdoor deck fronting a private pool just steps from the bedroom. Cool, subdued interiors are designed to contrast with the vivid tropical greenery outdoors and provide an instant sense of calm. Glass walls, wood panels and natural stone present a harmony of the elements, while signature outdoor soaking tub gives you another way to enjoy this stunning setting. With a unique location close to the cliff side, the Ocean Front Suites are 84 square metre hideaways defined by a chic design that frames the tranquil seascape. Cascading down the cliff in a feat of ingenious modern architecture, full length windows bathe each suite in natural light. Adding an even greater sense of luxury, each balcony boasts our signature open-air Jacuzzi, inviting you to soak up the scenic Indian Ocean splendour. With an enviable position at the front of the resort, Ocean Front Pool Suites look out to inspiring, evolving views of the Indian Ocean horizon. Covering an impressive 110 square metres, the inviting outdoor space comprises a deck edging your private infinity pool and outdoor Jacuzzi. Step inside to find a cool and relaxing interior that is designed to the highest level of contemporary style. Making the most of magnificent coastal surrounds, our Two Bedroom Ocean Front Pool Villas reveal a 180 degree ocean panorama; reflecting nature with a contemporary interior of hardwood flooring and accents of stone and glass. With an impressive 296 square metres, these villa havens are perfect for small families or groups of friends. Tropical pleasures abound with a private pool, sundeck and garden, as well as a Jacuzzi in the master bedroom bathroom. A private pool, beautiful garden and dramatic position looking out to the Indian Ocean create the ultimate island hideaway. Our Three Bedroom Ocean Front Pool Villas reveal the most unique and awe-inspiring 180 degree sunset views of the Uluwatu western coastline. Enjoy 330 square metres of thoughtfully designed space, including attractive living, dining and kitchen areas, ideal for entertaining, relaxing and savouring romantic moments. Adjacent to the pool, the master bedroom reveals a stunning view and boasts a luxury en-suite bathroom with a Jacuzzi. With two guest bedrooms each with their own en-suites too, there is ample space for the whole family to unwind or for friends to enjoy a wonderful holiday together. Start your day with an extensive breakfast buffet. Choose from a wonderful selection of light and healthy dishes for lunch. Return for sundowner cocktails prepared just the way you like them, or try one of our expert mixologist’s unique island inspired creations at our lounge. Evening dining marries gastronomic excellence with an atmosphere of simple elegance. Gaze over reflections of azure water as we stimulate your taste buds. Inspired by contemporary fusion style, lunch and dinner menus feature popular western and bold local dishes, riveting Asian creations and a nod to Mediteranian cuisine. All time favourites include seafood scooped fresh from the ocean is flame grilled to perfection. Imaginative, freshly prepared salads can be followed by the pleasures of ice cream. Enjoy a sophisticated wine and champagne menu, signature mixologist cocktails, and live acoustic band performance. Reserve this stunning cliff top lounge and balcony for special private events and wedding celebrations. Elegantly designed in rustic vintage style, Dewika Lounge invites you to dine and celebrate with a 180 degree panoramic view of the Indian Ocean. Admire Uluwatu’s legendary sunsets as you savour delectable cuisine from our Balinese culinary team, with four long dining tables, each accommodating 10 guests, complemented by comfortable lounge sofas seating 15 people. Designed to reflect a traditional Balinese rice barn, our Spa offers a tranquil sanctuary for relaxing and invigorating beauty and wellness journeys. Individual treatments and signature sequences are performed by highly trained therapists, to suit each guest’s needs and mood. The extensive treatment menu pays tribute to Indonesia’s Spice Islands, as well as ancient wellness secrets from across Asia and advanced western practices at this spa resort in Bali. Bali`s most famous wave is on our resort’s doorstep, and the entry and exit point is the cave just downstairs from The Blue Point Hotel. This long left hander handles any swell size and is very consistent, though not a beginner’s wave as it is prone to strong currents that depend on the tide. Comprising a series of breaks to choose from on the Bukit Peninsula’s southwest tip, highlights include barrels at The Peak and the speed of The Racetrack, which ends in a multi-twisting barrel that should only be tried by the experts. Conveniently located directly below Anantara Uluwatu Bali Resort, Impossible attracts surfers not yet advanced enough to handle Uluwatu or Padang-Padang’s heavy waves. Featuring two main take off points at the top and bottom sections, surfers are advised that the swell directions, sizes and periods here can be unpredictable. The long left hander needs a bit of swell size to work properly. On its smaller days it breaks in many sections that are usually hard to make, but when the swell gets bigger it can be a real gem with endless walls. Five minutes from Anantara Uluwatu Bali Resort, Padang-Padang offers one of Bali`s heaviest waves. The short left hand break needs a bigger swell to work properly, but this is the place to head for big cavernous barrels or to hit the shallow reef. Professional surfers flock to this spot to catch the huge swells that form some of Indonesia’s most impressive barrels. However surfers must assess the tides, as during lower tides the end section breaks below sea level at the jagged reef. With potentially dangerous wipeouts, the challenging barrel is for advanced surfers only. On the right hand side of the channel, a short and mellow right hander awaits boarders during mid to high tide. Suitable for not-so-advanced and beginner surfers, this wave is sometimes referred to as Baby Padang. Located at the end of the Impossible’s reef, though Bingin doesn’t produce a long wave, it does deliver perfect barrels that are clean and open. Best described as short, sharp and shallow, the tight take off zone is usually full of good surfers all trying to catch one of the tubes. At low tide the reef gets very shallow. Ideal for beginner and intermediate levels, Dreamland is a prime spot for both longboarders and bodyboarders. On the left hand side of the beach you’ll find a mellow A-frame wave and on the right hand side a beach break-like wave that favours lefts. Dreamland is best surfed during low tide and medium swell. The reef underneath consists of round rocks. This is a wave well suited to not-so-advanced surfers. Usually the currents are not strong and chances of hitting the reef are low. Another left hander on Bali`s Bukit Peninsula, this wave consists of two different sections: the Point which is a bit slower, and the section further down the line. Sometimes these sections connect to one long wave, but this only happens on larger swells. On smaller days this can be a fun wave for intermediate surfers and beginners. Due to the reef, surf boots are recommended, especially during low tide. This wave on the south coast of the Bukit involves a long hike down many stairs to get to the water. It is easily blown out by the wind and picks up any swell around. The swell hits the reef out of deep water and produces mostly right handers. Green Ball is a great place for spotting marine life. Located on the south coast of the Bukit with a long hike to the water, this wave picks up a lot of swell. There is a right hander on one side and a left hander on the other side of the channel. The bigger the waves get, the stronger the currents are. The wave is best surfed during mid to low tide, and can change from a nice mellow fun wave on a small day to a challenging beast on bigger days. Following the coastal road in the direction of Nusa Dua, there are a couple more surf breaks to find. Nusa Dua is named after two small islands and features a couple of surf breaks. On the southern side of the southern island there is a short left called Black Stone. In between the two islands is Mushroom Rock. On smaller days you’ll encounter a fun right hander, and on bigger days a roaring monster. Best surfed during higher tides, these breaks tend to work better in the rainy season due to the offshore winds, and in the dry season these spots are easily blown out by the wind. These are the more well-known spots of the Bukit Peninsula, and there are plenty more to find for surfers who are willing to explore. Inspirationally located along Bali’s secluded southern coast, the Resort cascades down the cliff of Impossible Beach, aptly named for its limestone cliffs, secret caves and wild waves. An escapist’s dream of unending Indian Ocean views, legendary surf and mesmerising sunsets, the rugged cliff-side beauty is matched by Anantara’s chic luxury and our uniquely flexible Balance wellness concept. Relish the personal freedom to find your perfect balance, engaging in rejuvenating wellness experiences or the pleasures of pure indulgence to suit your mood and needs. With Balance the choice is entirely yours, thanks to a wide choice of healthy and holistic activities that can be booked individually or tailored into a personal programme, guided and supported by our team of specialist wellness experts. Restore your vitality with this series of rejuvenating therapies, incorporating uplifting herbs and spices to arouse the senses, stimulate the body and leave skin exquisitely smooth. Originating from the Royal House of Java, this traditional beauty ritual is no longer reserved for royalty, but is sure to bestow a regal radiance by relieving tension, improving blood flow and bringing waves of muscle relief. Our signature blends of oil, combined with purpose-designed movement, stimulates the circulation and promotes deep relaxation, whilst restoring the flow of energy or prana, along the meridian lines. Treat your skin to an ancient Balinese body mask, combining a mineral rich white kaolin clay base with spice and bark to draw out impurities and nourish cells back to health. Work out at the 24 hour fitness centre to lose weight, tone up and get fit. Immerse yourself in the beauty and cultural traditions of our exotic destination, learning elegant movements in a Balinese dance class. Located just about 40 minutes from Bali’s Ngurah Rai International Airport, the Resort is the ideal embodiment of the island’s natural beauty and spiritual charm. Situated on Impossible Beach, with its dramatic cliffs and sheer drops into the Indian Ocean surf, tour offers an experience quite unlike any other found on the island. Whether you are looking for adventure sports, beach relaxing, inland treks to volcanic landscapes or mist-shrouded Hindu temples, our location is unbeatable. The resort is tucked away on a surreal landscape that feels secluded from it all, yet only 40 minutes’ drive from the bustling beach scene at Kuta, the world-renowned surf at Legian and the stylish wining and dining hub of Seminyak. We also offer easy access to the island’s inland cultural heartland of Ubud and the seaside temple of Tanah Lot. Bali’s Ngurah Rai International Airport is located in Bali’s capital Denpasar, approximately 20km from the resort. The airport offers direct or connecting service to destinations all over the world. Domestic airlines link Bali to all of Indonesia’s major cities, including the capital Jakarta, with regional airlines such as Air Asia and Jetstar offering low-cost service connections through Kuala Lumpur and Singapore. Let us go the extra mile (or kilometre, if you prefer). For limousine service to our resort, please email us for more information and to arrange pickup time. Pre-paid public taxis are also available from clearly marked counters after exiting immigration and customs. "Me and my wife have been here in September 2016 for our honeymoon, we where amused by the view from our room and the room. The food was delicious, the surf was amazing and the staff was welcoming and helpful. 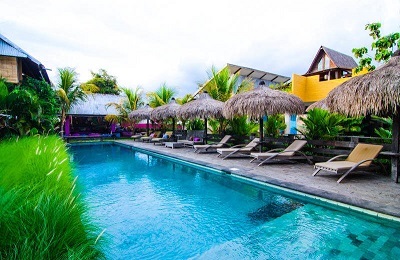 I would certainly recommend anybody going to Bali to stay in Impossibles Surf Hotel"
"I chose this hotel because it was near surf spots that my husband would enjoy. I was blown away by the property's setting...the immense staircase leading up to the open air lobby with spectacular views of the ocean. The staff greeted us with a cool beverage and a flower for my hair. I could not take it all in at first, but the floor and lobby desk were made of this amazing stone that seemed to glow. The flowers were everywhere, which perfectly complemented all the stone and cement...an odd yet pleasing mix of nature and manmade edifice. Our room set into the cliffside had the most amazing and expansive views I have ever enjoyed in a hotel room. The room was huge, the patio/balcony was also large...everything about this property seemed big and bright. While my husband surfed, I enjoyed a lounge chair by the pool, which also overlooked the ocean. The staff were warm and attentive, and the food and drink delicious. We indulged in the breakfast buffet every day, which never disappointed. The international diets were well represented and I enjoyed a cronut every day with my latte. I recommend the hotel's spa...the balinese massage was incredible. 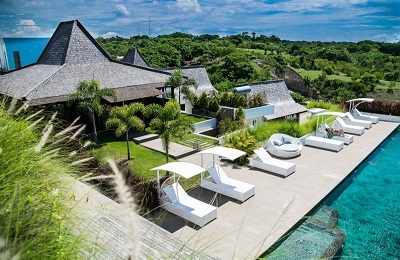 If my husband wanted to go back to Uluwatu to surf, we would most definitely stay here again. Oh, and one last detail Dining by Design is a must. A romantic dinner for two at sunset all by ourselves on this balcony with a perfectly created setting of flower petals, lanterns, and sea breezes. It was one of the most romantic settings I've ever experienced." "The level of service at Impossibles Surf Hotel is simply outstanding. My wife and I honeymooned at the Four Seasons in Bora Bora several years ago and our stay here made us second guess our honeymoon choice. We were given room 601 which is an ocean view suite with a private infinity edge dipping pool directly over the main pool which looks out directly to famed surf break, Impossibles. Absolutely stunning views, exceptional service everywhere we turned, impeccably clean accommodations, and extremely reasonably priced for this level of luxury standards. The spa services are absolutely in line with the rest of our experience. We had partaken in various massage, manicure, and pedicure sessions and each one left is feeling taken back by just how good each of them was. The dining options are varied and equally up to par. Their 360 Restaurant serves a fantastic breakfast that caters not just to Western and Asian taste but also sports a fresh juice bar with intricate healthy concoctions made to order and delivered right to your table. Their teppanyaki style restaurant, Sono is both exceptional and fun. Their bbq grill restaurant, Sea Fire Salt sports alternating nights of either seafood or meat based fare and, although this was our least desired of the choices it was still very good and continued to boast an extremely friendly and accommodating staff. Aside from these offerings we had also partaken in many meals delivered to our room with consistent results. The concierge is very quick to respond to any needs and was able to put together some fun surfing excursions for us each morning as well as quickly book restaurant, spa, and airport transfer reservations. All in all, our stay here was exceptional and we left feeling hard pressed to say how it could have been any better."